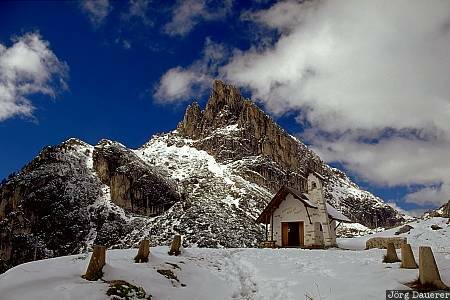 A small chapel at the top of passo die Falzarego in the Dolomite Alps near Cortina d'Ampezzo covered by fresh snow. Cortina d'Ampezzo in the province of Belluno in northern Italy. This photo was taken on a sunny day in September of 2001. This photo is part of the exhibition Lonely Chapels (October 2010).